Music Together is a music and movement program for children from birth through age 7 that, according to their website, serves 2,500 communities in more than 40 countries. 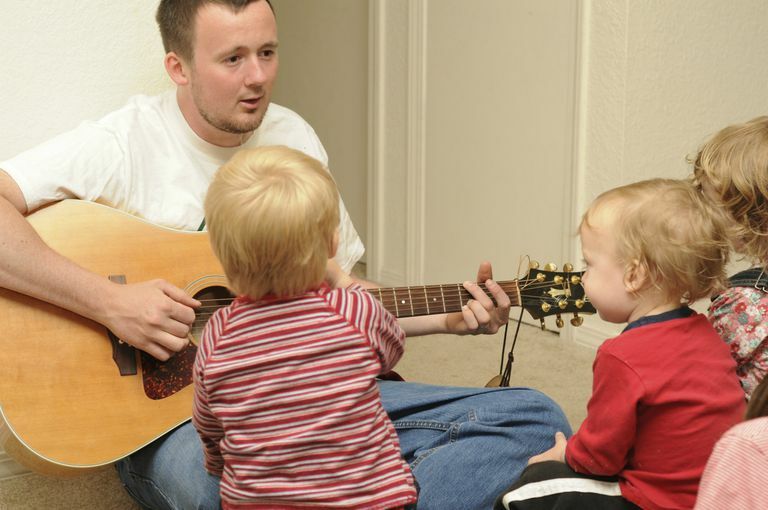 Parents and caregivers attend the classes with children, helping them learn how to sing in tune, keep a beat and participate in an active music curriculum that is tailored to specific age levels and provides a good introduction to music for toddlers. Although Music Together is an internationally recognized program, its classes are run by local members of the community: musicians and teachers who are trained to lead early childhood music and movement classes based on the program's philosophy of research-based, developmentally appropriate instruction that emphasizes adult involvement. Music Together classes are based on the recognition that all children are musical. All children can learn to sing in tune, keep a beat and participate with confidence in the music of our culture, provided that their early environment supports such learning. I enrolled my two oldest children in two semesters of Music Together when they were 2 and 9 months old. To my understanding, classes don't usually include children with such a wide range of ages, but our local director was willing to make greatly appreciated accommodations. It made me feel like the center in my town wanted to focus on the needs of the local community rather than strictly adhering to corporate guidelines. Just being able to have an activity that I could do with both of my children together makes Music Together a valuable investment, but aside from that perk, which may not always be available, the classes were one of our family's favorite parts of the week. The "Hello Song" itself is worth the time and money: it's a simple, repetitive tune that gets the class acquainted while miraculously seeming to settle wee ones and getting them to pay attention! In fact, that song and several others are included on a CD that you can take home. We listen to these tunes over and over again. The music is lively and very easy to follow along. I definitely feel like the music helps to build an awareness of sound, even amongst such young children. At this age level, music class is nothing like it will be in the years to come. Elements of rhythm and changes in tempo are wonderfully taught and emphasized through physical movement. Dancing with scarves, fluttering a parachute and planned motions - all of these and other dynamic teaching methods really engage young children and are so powerful and work well in these lessons. Music Together classes are structured for a range of ages, but each class caters to a specific age group, ensuring that the children involved are participating with others who share the same general skill level. The classes are merely an introduction to the elements of music. Children won't learn how to read music or play an instrument, but if that's eventually something you want your child to take up, exposing them to the elements of music now might be beneficial later on. Tuition varies, but I found the costs to be affordable and even a little less than other music class offered for young children in our community. Can Music Really Boost Kids' Brainpower?